Somewhere between Missoula and Butte, Montana, John Lennon is singing “Imagine” on the stereo. “Imagine no possessions, I wonder if you can…” I start thinking about my bookshelves again. Road trips are great for self and life assessment. Besides the hours of sitting, new scenery rolls by and pulls me outward, away from my familiar. I think more largely around the wide open grasslands and hills of Montana where cattle roam by the roadsides and houses are scattered randomly. I think beyond my focus on things. After twelve hours on the highway, we drive another sixteen miles on a dirt road to arrive here on the ranch where I am visiting my niece. 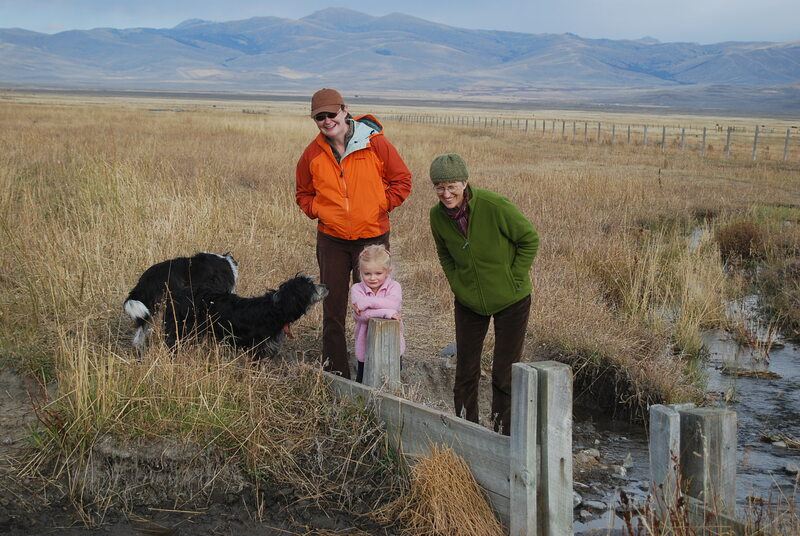 We look out across the Centennial Valley toward low lying mountains and fields of patchwork fencelines. 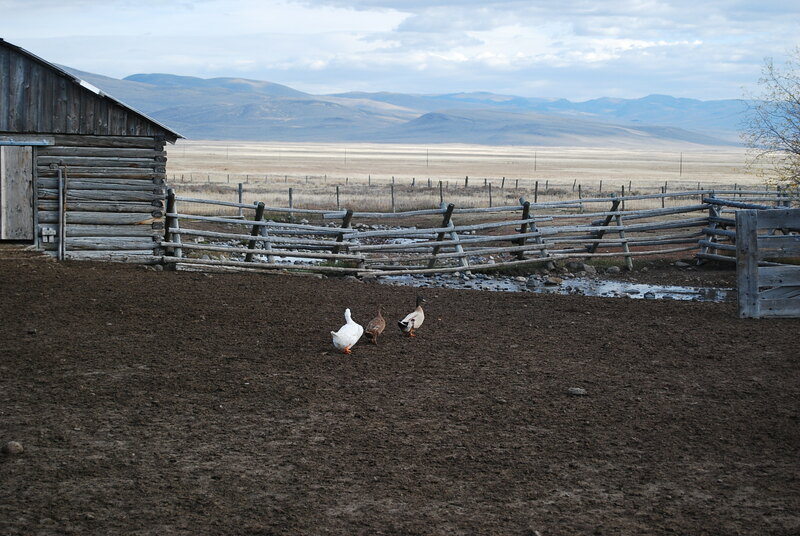 Our days follow the routines of animals: release the dogs in the morning and feed them… coax the chickens from their coop… gather eggs… walk behind the waddle of domestic ducks as they head across the yard toward the creek. We walk trails in the stubby grass and throw Pooh sticks above the weirs and watch as they make their way downstream. We sleep late, take afternoon naps. The Silence here is amazing. If I have any religion at all, it is the worship of silence. Not the silence of a vacumn, but the silence of nature. Wind caressing pine boughs. Waves crawling up a shoreline. Creeks babbling their wet tales. Here in Montana, my religion could prosper. Yet I find it difficult to just listen. I am not used to this stillness any more. I have developed the habit of busyness. Usually, from the moment I get up in the morning I am aware of technology’s pull on me. I want to know what my friends are doing and if anyone has sent me an email. I want to know what events are on the calender. I want to catch up on other blogs whose words inspire me. And, dare I say it, I want to be entertained. I want to feed a hidden hunger…a longing I have yet to name. The extra books on my shelves, the extra stashes of fabric, the notebooks filled with creative ideas are the promise of dessert, but it appears that I have become too full from the main course… my steady diet of doingness: exercise, work, making art, projects, surfing the Internet. I used to imagine living in a small, off-the-grid cabin on my twenty acres near Lake Chelan. I could see a writing desk perched in front of the window’s expansive view and I could see words on paper as prolific as the Balsamroot in spring. But I recently sold that land. I didn’t want the isolation. Now I’m wondering how to find the middle ground between busyness and isolation. It’s not the Big Sky of Montana that I crave, but the wide open spaces in my schedule. I want some inactivity to punctuate my habitual movement. Perhaps I can settle here in this new place long enough to let the land teach me, in her quiet language, how to rediscover my own silence. 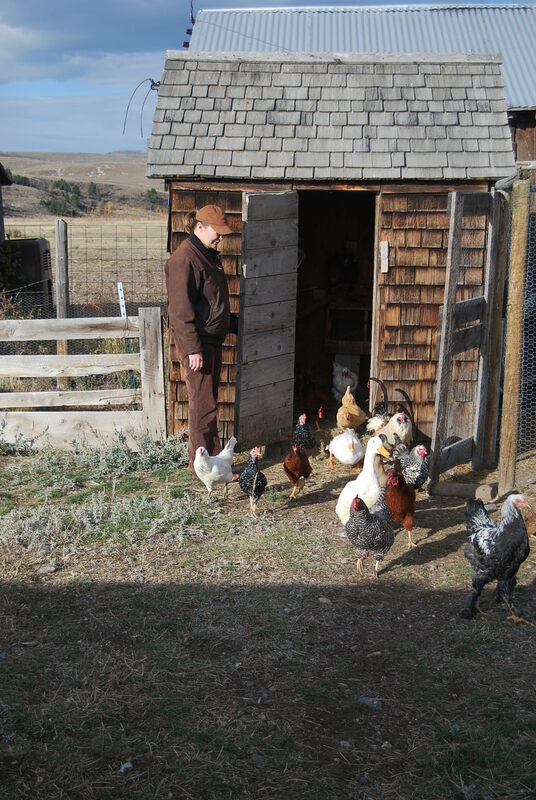 Looking out at the horses grazing near the house and the chickens wandering the garden, a new song comes to mind…not about possessions, but about the open country… Bing Crosby singing “Don’t Fence Me In”… reminding me to not let my habits of busyness take over. Instead, let the long to-do lists have boundaries…and a gate that I can step through and close behind me as I ride toward a wild country inside that I am hungry to explore. Thanks for your enthusiasm! It’s going to be difficult to leave Montana… the place and the people… so I hope that the finished remodel will be a good welcome home. That and my girls whom I miss very much! Awesome Jeanne! You’re coming back to the island… right? Oh yes, Kelly… I’ll be making my way home on Tuesday. Then I shall happily hibernate in my newly remodelled cottage! Jeanne, I have also enjoyed your lengthy recount of your feelings here about your trip! You were missed… and I’m sorry to hear that you returned to an unfinished remodel – but hey – welcome back to island life 🙂 ! 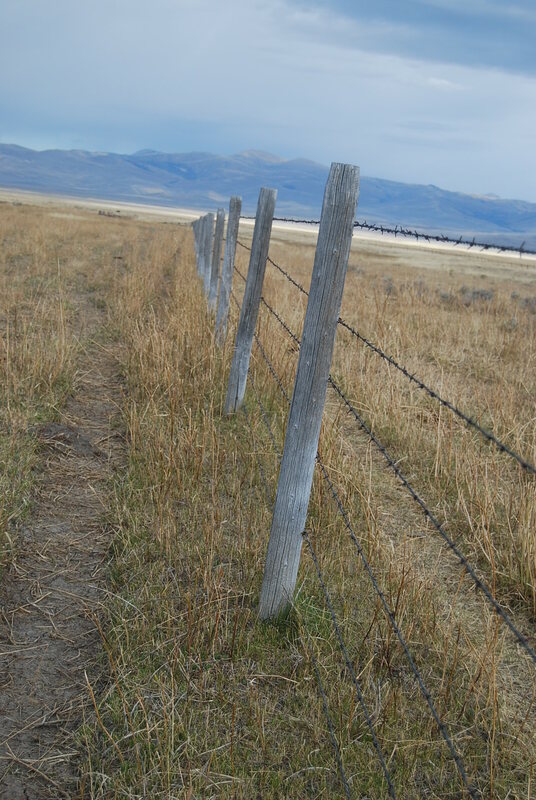 I loved the last picture of the fence posts – that’s my kind of picture!!!! Lovely. Thanks, Serafina… the re-entry has been a bit rough around the edges, but I love my recent “upgrades”!